The mission of the Texas Inmate Families Association is to break the cycle of incarceration in Texas by strengthening families through organizing, support, education, and advocacy. Twenty years ago TIFA was founded as a result of a conversation between two brothers- one in the free world and the other in prison. Stuart and Sheldon DeLuca concluded that the one substantial part of the “criminal justice system” that had no representation, either within the system itself or in the larger political system, was the families of offenders. They decided to see if they could remedy the lack of representation by establishing the Texas Inmate Families Association, better known as TIFA. Now, twenty years later in 2016, TIFA is celebrating our 20th anniversary. As families with incarcerated loved ones, we envision a system that humanely treats them when they are separated from us, and helps them prepare for coming home to us. 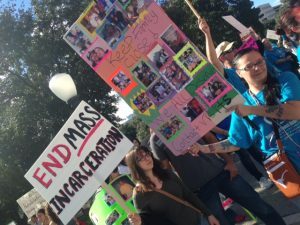 Over 500 men and women impacted by the criminal justice system marched at the State Capitol in Austin, Texas to demand change. Josh Gravens from Texas Cure, summed it up with the inspirational words, "We the formerly incarcerated and our families will stand shoulder to shoulder, there will be no more looking to others to fight for us, we will fight for change ourselves!" 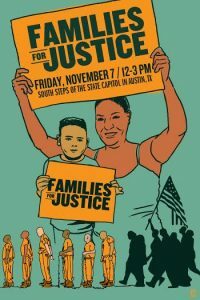 The Texas Families for Justice Rally in Austin, Texas clearly won't be just any rally. This is the beginning of a strong movement in Texas, where the voices of those most impacted by the criminal justice system will be heard loud and clear. A broken criminal justice system lacks transparency and accountability, creates harmful conditions for incarcerated people, imposes unfair barriers to success for people with arrest and conviction histories, and decreases economic stability among families, especially among black and Latino communities. 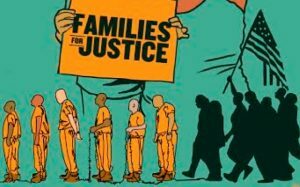 On November 7th, 2014 Texas Inmate Families Association (TIFA), Texas CURE, and Texas VOICES, are joining forces for the Texas Families for Justice Rally. This grassroots collection of people, most with imprisoned loved ones, will send a clear message to the Texas legislature--"the criminal justice system in Texas is broken." November 7th in Austin, Texas, voices will be raised to speak about how mass incarceration hit families the hardest. On the south steps of the state capitol hundreds of families will gather to say we have had enough. An artist from El Paso, Zeque Peña, generously contributed this incredible art. Check out his statement about its creation.